Collaboration & communication combined. Link your Slack and SwiftKanban teams to build the ultimate productivity powerhouse. Leverage the power of SwiftKanban in Slack. Integrate your SwiftKanban with Slack channel and start using the most powerful Lean/ Kanban based Visual Project Management software inside Slack itself. 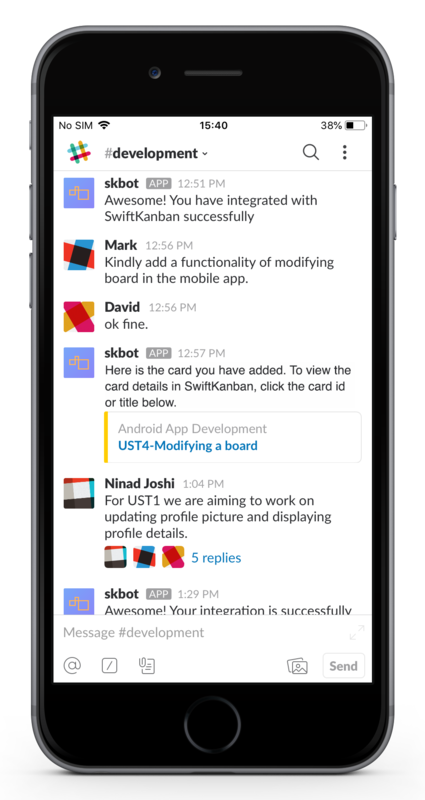 Invite SwiftKanban Bot into your Slack channel and start adding card to your Kanban Board directly from there. Just follow this /sk addcard (user card title) command and keep adding cards to the Board while you work in Slack. Select any message from the Slack conversation, add it to the card via the Add Comment To SK message action. Keep leveraging SwiftKanban via the Slack mobile app anywhere, anytime.